I fell in love with Pick Your Own as a small child. Running between the rows, stuffing our faces with strawberries, filling the little cardboard punnets with fruit to take home and enjoy in the garden, smothered with cream. My mother would always make a few jars of strawberry jam that perfectly captured the taste of summer and never lasted very long. 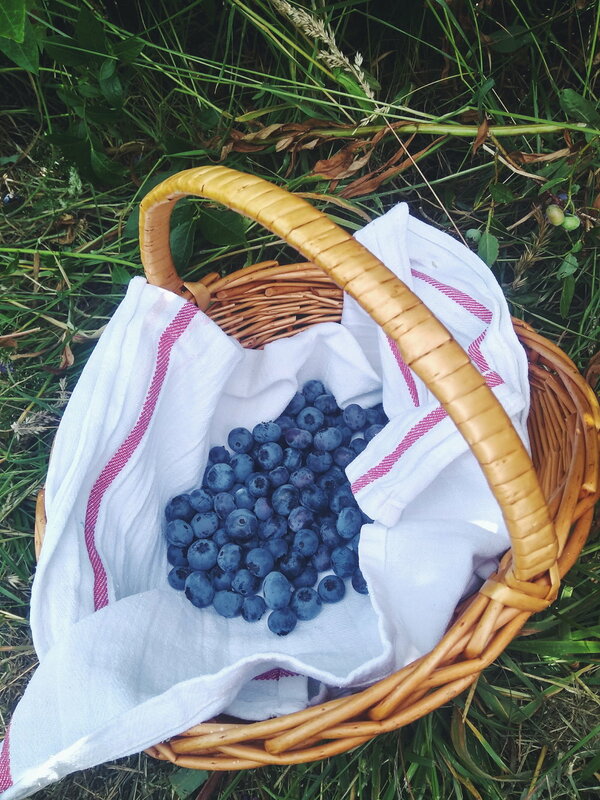 But we never saw Blueberries on our PYO trips, because they just weren't around. Although wild bilberries grow wild all over the country (including here on Exmoor where they're called Whortleberries) the large, cultivated blueberry is a relatively new addition to British fruit farms. it's only really in the last decade that blueberry farming has taken off in the UK, and one of the first companies was Exmoor Blueberries. In a tiny, hidden valley in the middle of Exmoor lies an incredible sight. Acres of blueberry bushes undulating up and down the hillsides, with the tall spikes of rosebay willowherb that grow between the plants marking the rows in thick stripes of pink. The acidic soil is the perfect growing medium and there must be something rather magical about the conditions because the blueberries there are like nothing I've ever tasted - a world away from watery supermarket imports. It was one of those perfect summer afternoons that you remember forever. We'll definitely be back, a lot! Thanks to my friend Alice for this lovely picture of Immy and me! These yummy Organic blueberries cost £7/kg (imported organic ones in Sainsburys are £18/kg) so as well as a couple of hours of entertainment, you also get phenomenal value for money. My enormous basketful was just over £11, and will fill half a freezer drawer! Freezing blueberries, by the ways, is super easy. Just lay flat on a baking tray and freeze overnight. Once they're solid, decant into a tub or bag and you'll be able to easily take out as many as you need. Don't freeze in the bag or they'll end up as a big solid lump! You can see more about the farm on their website, and there are regular updates on harvesting times on their Facebook page. There's no card machine so take cash, but there is a loo, parking and a lovely picnic spot!